This is a site for my family and friends to keep track of my boat-building progress. Feel free to comment. Got around to making a mobile fiberglass cart today. I decided to make it on wheels so that I could roll it around to the end of the Strong Back, making it easier to lay down a long length of fiberlass. 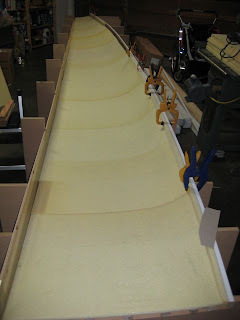 Or, I can roll it down the side of the float for cutting smaller sections of fiberglass. Materials used were 3/4 inch plywood, scrap MDF boards from my form frames, 2x6's, and 2x4's. Everything is screwed and glued, with construction adhesive holding the 2x6's onto the base. 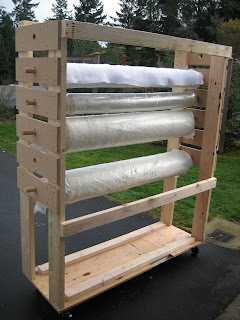 I decided to use closet rods to hang the fiberglass rolls, but the full rolls (weighing 110 pounds) sag a little in the middle. I suggested to Andrew that he try using the smaller diameter posts that are used for building a chain-link fence instead. Finished laying down the foam strips and attached the keel foam today. I cut a four foot section of foam and clamped that to the keel batten. 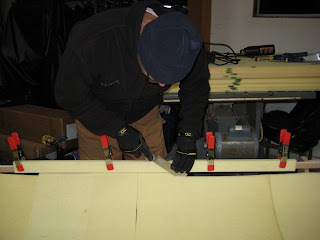 Then I took a Japanese-style pull saw (with a thin, flexible blade), and using the keel foam as a guide, cut the proper angle on the foam planks. After all the planks were cut, I slipped in the keel foam so that it was flush with the top of the keel batten. The foam was about 2 inches high, and I cut back where the form frames interfered on the bottom using a Stanley Surform pocket plane. By the way, you can replace the Surform blade with a Micoplane blade for better/faster results. 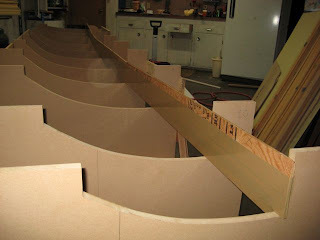 I finished up by screwing the foam keel in from the back side of the keel batten. 1) Install deck flange mold plate. Double-check that it is straight. 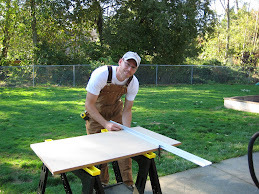 2) Install battens every 2-4 inches. 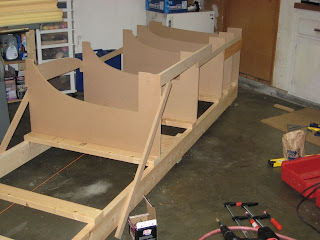 4) Install the keel foam after installing all foam strips. 5) Start around form frame six. 6) Measure distance from deck flange mold plate to keel batten. Using a (metric) flat back tape measure works good for this. 7) Mark this distance on half-sheet (4'x4'). Cut off piece using table saw. 8) Divide and cut remaining sheet equally so you have 8-10" strips. I get five at 9.5 inches. 9) Cut extra piece (see #7) in half. I get two at 8-9 inches wide. Eventually, I cut six of these in half to use on last four feet of stern. Very little wastage this way. 10) Temporarily lay down strip near frame 6. 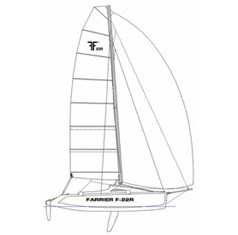 Make sure that length is just short of keel batten. 11) Mark placement of foam and pre-drill holes from top of battens about one inch from sides. With a 10" wide plank, I found two screws per batten usually worked fine. ws from Tacoma Screw, here in Seattle. #8 x 1" ZINC RWH PHIL STEEL K-LATH NEEDLE POINT 075-K14-1 for those that are interested. 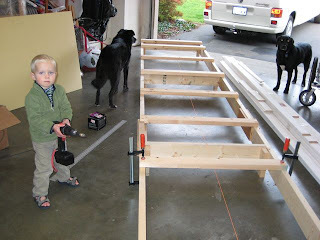 13) I made up some clamping "bars" using 3/4 inch plywood (experimental version below). They are 2x20 with a 2x3 3/8" plywood piece glued to one end. 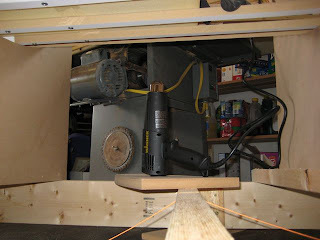 Slide to one edge of the new plank and then clamp down just on the other side, as shown below. This works well if you are planking by yourself. 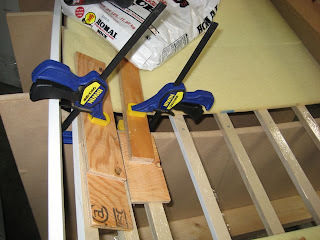 12) Clamp down foam using three plywood bars and quick clamps. 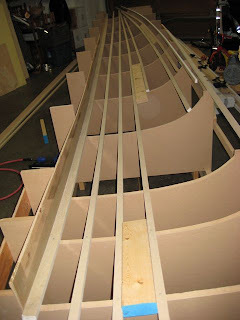 One bar near the deck flange mold plate, and two bars on the curved part closer to the keel. 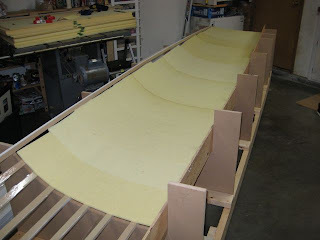 13) Starting at the deck flange mold plate, attach screws through the battens into the foam from underneath. 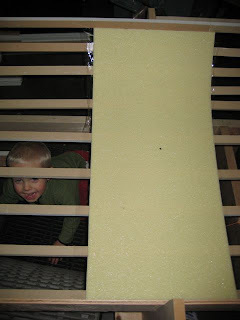 I found kneeling/laying on a foam sleeping pad worked well. If bar clamp is not on a specific batten, make sure you are pressing down on the top of the foam with your hand. This seats the foam properly and makes sure the screws are in as far as possible. 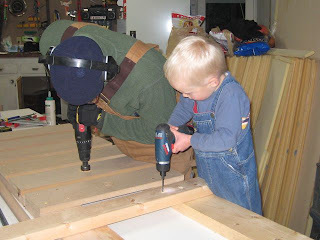 Using two drills works fastest. I set up my large cordless with the drill bit, and used my pocket drill to drive in the screws. Having the smaller drill/driver (Bosch PS20-2) is really nice while working underneath the battens. 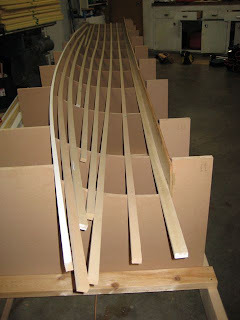 14) Thermoforming will help in the curved areas. I used a digital heat gun with multiple fan/heat settings and set that up underneath the keel area battens with the heat directed upwards. This works fine as long as you don't get the foam too hot (no scorching), and you don't leave it in one area for too long. Andrew and I came up with this solution for the bow battens. Decided to try using MDF as battens. I ripped a bunch of 12 foot 1x6's into 1" strips and put them down every 3-4 inches. I think they came together pretty nicely in the stern. The bow gave me a little trouble, but I think I came up with a good solution. Plans call for a 4" high deck flange mold plate to be attached on the deck side of the float frames. This creates an area for the fiberglass to run up onto for a couple inches and is designed to form a 2" flange for the float deck to sit on. I used 3/8" plywood that was kerfed every four feet or so. Packaging tape provides a releasable surface that the fiberglass will not stick to. 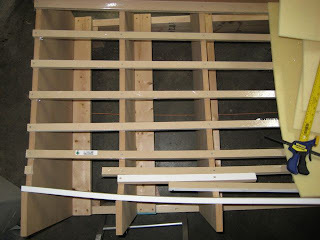 Attached the form frames to the Strong Back using the center string and a level to keep everything straight and plumb. Andrew told me about a special screw designed specifically for MDF (from Spax), which I found at Home Depot. Works much better than regular screws. 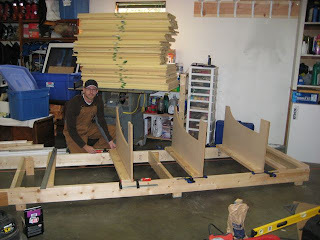 The frames are temporarily held in place using scrap wood until I can attach the battens. The foam and fiberglass arrived from Noah's Marine. It took about a week to get here, which isn't too bad considering it came across most of the country. 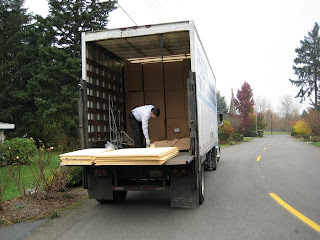 Grand total was 875 pounds for the materials, including Andrew's half. Also finished putting the spreader cleats onto the Strong Back at the appropriate spots. The center string (see below) is used to align the form frames. Adam is helping me with the drill/driver.